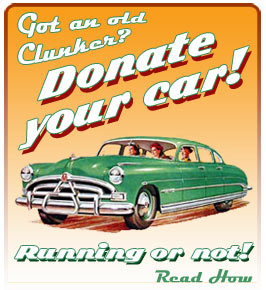 We want your old clunker! The Village is now able to take tax-deductible donations of used cars, motorcycles and boats through Vehicles For Charity (VFC) a national organization with an A+ Better Business Bureau rating that has served more than 2,000 charities. To give, go to the VFC web site. • Enter “Foggy Bottom West End Village” in the “Donate your vehicle to…” box. • Complete the rest of the form. A representative from VFC will call you to confirm and give you instructions on filling out the vehicle title and turning over the vehicle. After the vehicle is sold, VFC will tell you the amount of your charitable donation. Your tax deduction will be based on the resale value of the vehicle at auction. The Village will receive 80% of the resale value. To make a donation, you must have a vehicle title and VIN number. The vehicle must at least have an engine and be towable. You must know the mileage, make, model and year. You do not have to be a Village member to make a donation, and you don't have to live in Washington, DC, just somewhere in the continental United States, so talk to your family and friends! Questions? Call VFC at 1-866-628-CARS (1-866-628-2277). What are the benefits of donating my car to Foggy Bottom West End Village? The Village benefits by receiving a cash donation to fund new and existing programs and increase community awareness through local events. Many types of motor vehicles are accepted including boats, motorcycles, trucks, and cars. If you are uncertain as to whether or not your vehicle is eligible, please contact the vehicle donation program toll free at 1 866 628 2277. We make donating your car as simple and convenient as possible. A tow company will contact you within two to three business days. Call our representatives at 1 866 628 2277. What if my car is valued over $5,000?